Firstly, can I just say thank you so much for all your support and lovely comments about my grass tutorial. It really means a lot to me that you might find it any good. This week, our Sunshine Sari has chosen Birds of a Feather. Nice simple one this... we'd like to see birds! Maybe you fancy making a birdhouse? If you stalk Sari's Blog like I do, you'll know what I mean. Otherwise, you could use an image with a bird, bird papers, whatever you fancy, so long as we can see a bird. We have a lovely prize from Crafty Emma, thanks Hun. Before I head off for a cup of tea, (bad things happen to me if I try and do too much without my first cup of tea of the day.) there are fab new releases over at Some Odd Girl later (about 2pm if you're in The UK.) today. Check the Store out for an instant purchase hit, or visit the Blog and see some gorgeousness from The Odds. This is so sweet Faye! I love those birds and their house and the paper is perfect! Gorgeous card Faye, love the doodles and the fab birds. Brilliant card Fluffy...love your birdhouse! Gorgeous Card Faye, I like the sweet bird house, the colours and the layout. Such a sweet card with bright happy colors!! 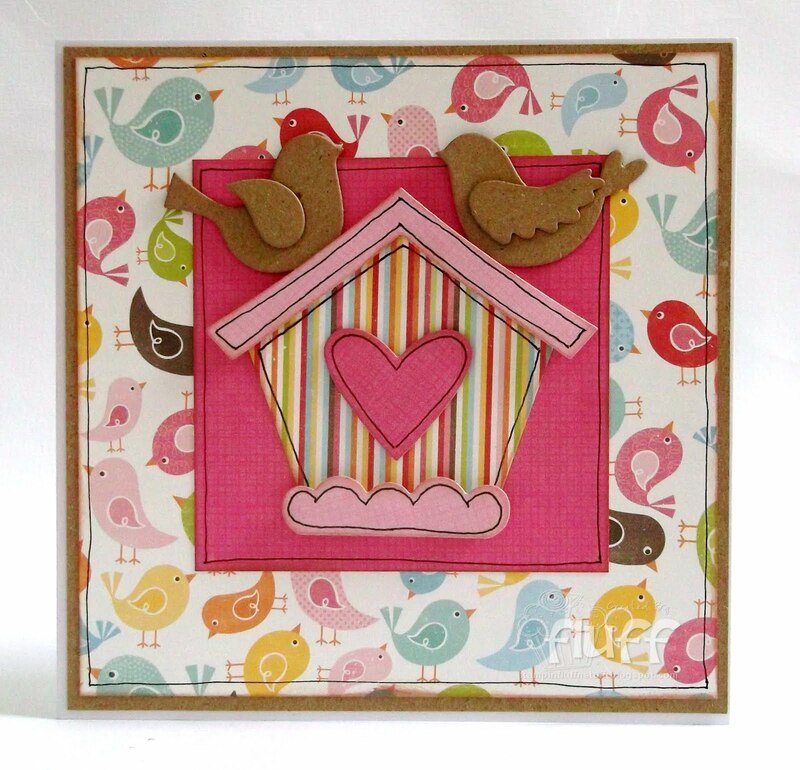 I love this sweet birdhouse, and those birdies on the paper are fab!! Beautiful work my friend! Fabulous Faye, love the colours and great layout! Hi Faye - love this one! Perfection! Thanks for joining in with us at Dream Valley as well. Hey Man! Checked out yer grass tutorial, but it wasn't heavy or quite what i was expecting man! I thought we were gonna like...trip out man...like...go on a journey man. Hi! really sweet card and the papers are gorgeous too. So adorable Faye! I always love your doodling! Awesome card! Love the whole bird thing ya got goin on...looks fantastic. Such a sweet, beautiful and adorable card. Love the colour palette, the bird house and of course all the birdies. I love your die cut birds and birdhouse! And that paper is FAB! Very sweet card! Thanks for joining us at Robyn's Fetish challenge!